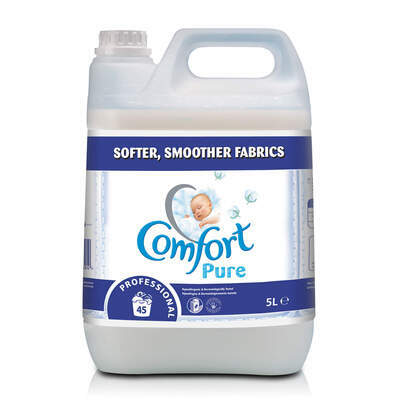 Stock up your utility cupboard in any nursery, primary school or care home with our economical double pack of Comfort Pure Fabric Softeners. Each 5-litre bottle is packed with a fibre moisturisers which work their way in your fabrics and keep them soft and fresh at all times. Collectively, these two bottles will offer up to 280 washes making them the ideal choice for high-traffic laundry rooms while the dermatologically tested formula has been proven to be soft of sensitive skin and ideal for babies. With skin care research that has been recognised by the British Skin Foundation, this expert fabric softener has been voted the UK's number one and promises to work gently with skin prone to irritation. Once the latest load has been spun, keep all the clean laundry together with our Addis Laundry Basket 40ltr.